I’ve got 2 big WIPs that are battling for my attention. I would like to have both finished by the end of the month, hopefully I will succeed! My first WIP is a knitting WIP, my Calvert cardigan. 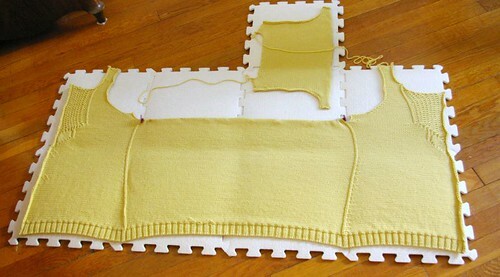 I’ve knitted the fronts and both back pieces, you can see them below blocking on my new blocking board. I’ve also started working on sleeve #1. I’ve only 12″ to go before the sleeve cap so it shouldn’t take too long. After knitting the second sleeve I will have to assemble the pieces together and then knit a band around the fronts and the neck. I’ve already tried fitting the existing pieces together and it looks like it should fit, so I have high hopes for a nice cardigan. My second major WIP is sewing WIP and made of 23 parts. I try to do at least one step a day and I definitely see progress being made. 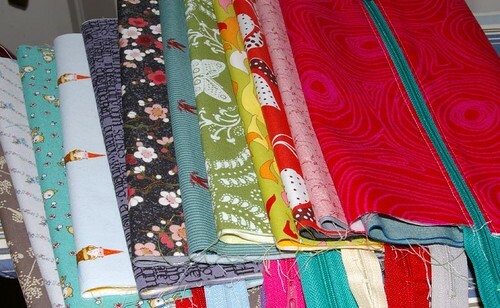 Tonight I have to decide: will I sew or will I knit? Are you a tight knitter or is it my imagination? 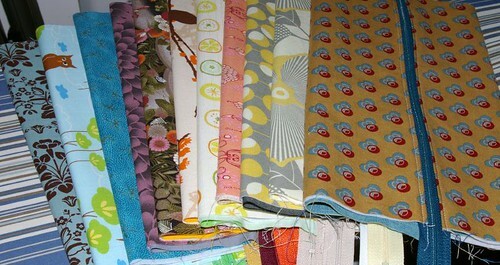 To sew or to knit? That’s a tough question to answer – especially when all of your projects look so great! Wow, you’ve been busy! Most of a sweater and a whole lot of sewing. If it were me, I’d finish off the sweater. We’re supposed to get really cold temps this weekend. Brr! You could do both, a little knitting than a little sewing. I still love my little bag! Hmm – curious about what the sewing is! I too loooove my bag and I see that you will have a gnome one done soon?! happy new year! :o) ek.